A French painter of Avignon, of which little is know, though he is attributed to some fairly famous works. 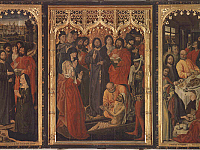 One being the Aygusi Altar, a triptych of Moses and the Burning Bush, from 1476 in the Aix Cathedral (Cathedrale Saint-Sauveur d’Aix) in France. 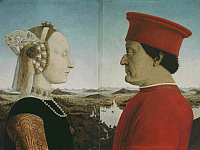 He also painted portraits, two of which were painted between 1476 and 1479 and are now in the Louvre in Paris; Portrait of René I, Duke of Anjou and, Portrait of Jeanne de Laval. In the Uffizi Gallery is his, Resurrection of Lazarus, signed and dated in 1461 and at the Uffizi since 1841. This piece was presented to the monastery of Bosco ai Frati in the Mugello by Cosimo the Elder who had received it as a gift from Francesco Coppini, the Papal Legate in Flanders.